I spent part of Christmas morning volunteering at the Salvation Army’s holiday party for the needy. 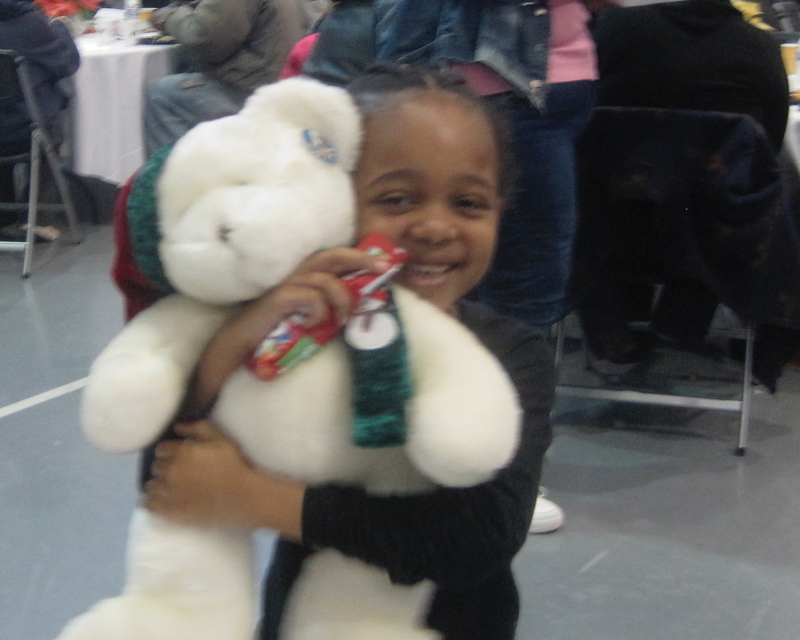 Every square foot of the giant rec room was occupied with food, face painting, Santa, a live band, a walk-around magician, and a toy and winter clothing giveaway, all sponsored by a local Italian restaurant and many, many donors. Yes, we totally tripped over each other, but it was a gas. Below, our coats thrown into a heap in the kitchen by a box of aluminum serving pans. That’s mine above left, with the fuchsia scarf. The chef seasoning the next massive pan of macaroni and cheese. Mr. Cutie below isn’t afraid. And his mom has no qualms about joining him. The little boy on the right was very resourceful in thinking to use the box from his new truck as a tray for his two desserts. But he was so amped up that they slid off. I’m actually surprised he made it to his table. This was shot just before both desserts took a splat. Face painting, patience, and another pink slip owner. *Another woman had her eye on some winter gloves being offered free of charge, but didn’t feel comfortable going to the table to get them, so she asked me to be her scout. 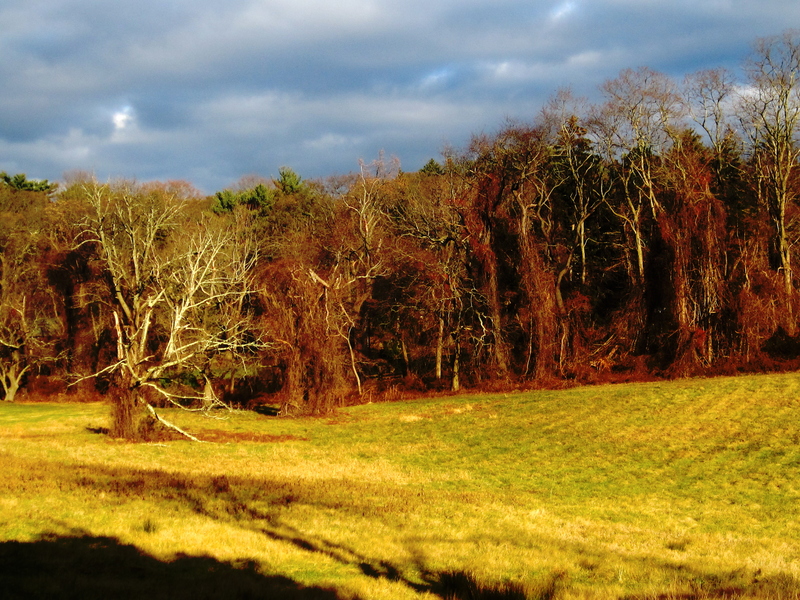 She was quite earnest; had the color all picked out because she could see them at a distance. I got some for her pal, too. When I brought them over she grinned and high-fived me. 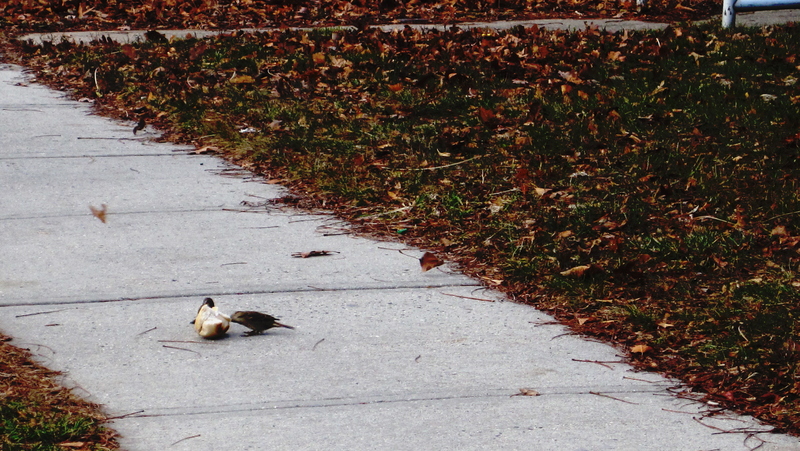 Speaking of birds, here are two outside the building with a Christmas bagel. Sounds counter-intuitive, but there it is. 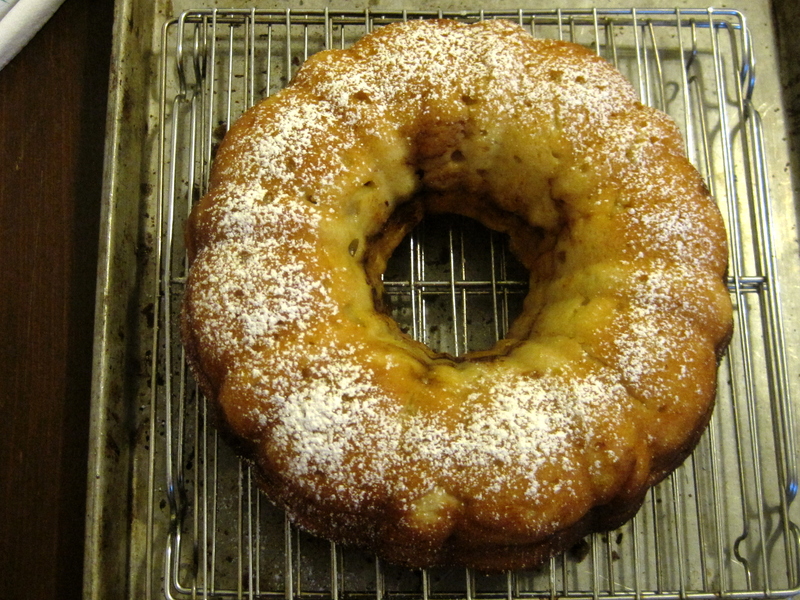 ..and eating a great deal of the sour cream coffee cake I bake myself every year. 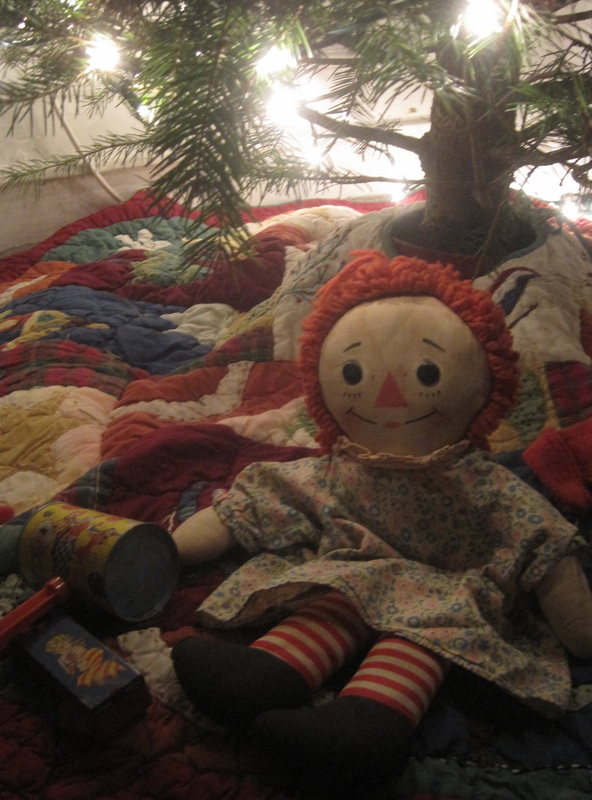 My Raggedy Ann (circa 1970) always sits under my tree, which is in my room so I can look at the lights as I fall asleep. Sometimes when I refill the water in the base I accidentally bump into her and she flops flat backwards, which kills me every time. She’s old and stained, but she’s still got comic mojo. Skimming through my 1924 Hallowe’en party book (written back when they still threw in the apostrophe), I’m struck by all of the activities people did by hand. The book offers hosts and hostesses ideas such as cracking whole walnuts, removing the nuts within, slipping a fortune inside and gluing the shell back together; making homemade cakes and hiding more fortunes within; and setting up tubs for apple bobbing. Water, paper, mud, flour, paste—all are liberally applied in the projects provided. It’s clear the author assumed people would put their hands in stuff and think little of it. I’m also amazed at how fearless it seems earlier generations were. In 1924—long before the advent of the Sharpie marker—instructions direct hostesses to heat the point of a knitting needle over hot coals and burn it into walnut shells to make facial features; to poise chestnuts at the tips of knives, then give to children to hold during relay races; to bob for apples with no worry for germs (the biggest risk, it seems, was spoiling your hairdo); and to douse cattails in kerosene and set them on fire, as makeshift torches. The drawing above is on the cover of the book I mention. 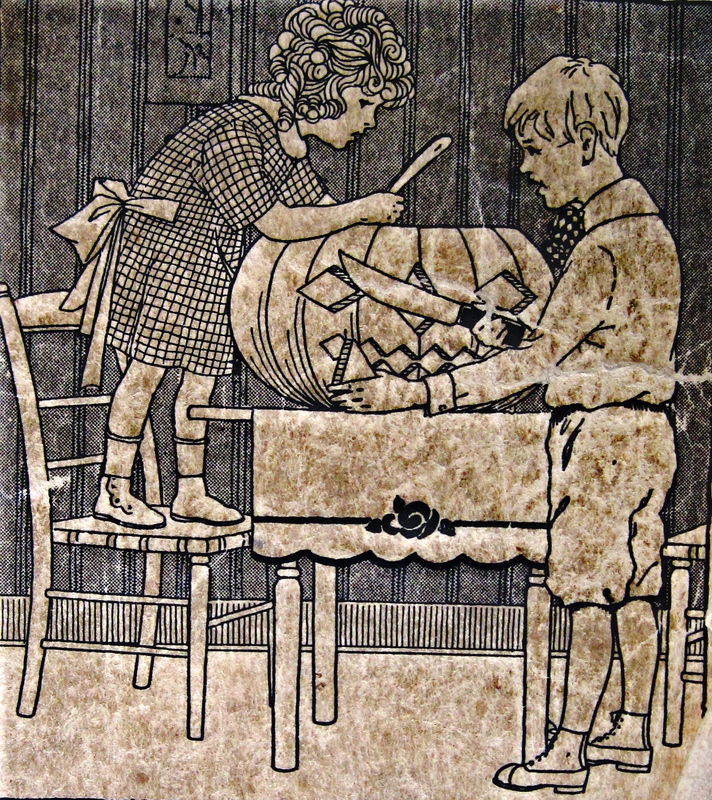 The little girl stands on a chair so she can reach to scoop the inside of a pumpkin. She’s five or six at best, but no adult is standing behind her to make sure she doesn’t fall. And the boy—eight? nine?—wields a chef’s knife bigger than the one in my kitchen; and again, adults are conspicuously absent. The Little House books, which recall everyday life in the late 1800s, similarly depict an ease with skills—again, from a very early age—that may surprise us. Here is little Laura chopping vegetables alongside her mother over a primitive stove, there is her five-year-old sister Mary stitching on her nine-patch quilt. 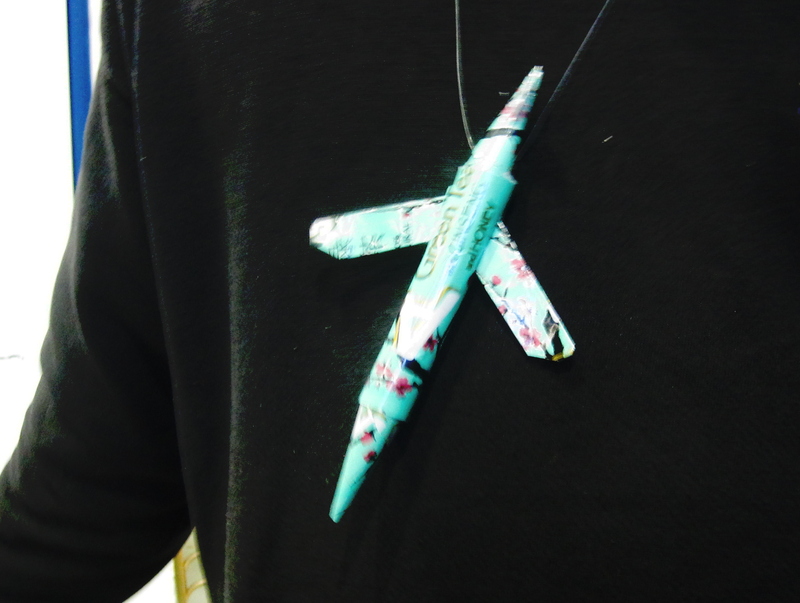 With a real needle. I used to work in nursery schools, and any project that required stitching was done with a large, plastic, dull-tipped ‘needle’. And even so, we teachers supervised at every moment. It’s fascinating to me that earlier generations took hands-on skills for granted. I don’t support helicopter moms who scamper after their kids all day long with mini bottles of Purell, but neither would I let a child of today use a sharp needle, let alone handle a knife or hold a lit torch. I wouldn’t let a child take food out of a hot oven, or cook over a hot stove top. But apparently it’s a modern-day phobia. A chicken and egg conundrum comes to mind: Were people a few generations ago braver than we are today? Or did handling knives and needles and fire on a regular basis make them braver, just by cultivating confidence in their ability to use tools and to harness elements safely and effectively? Let’s take it a step further. Looking around at where we are today, ever in pursuit of the faster, the shinier, the more advanced, have we lost pertinent skills? With a few exceptions, we tend to buy our quilts today. Meals often mean microwaving or eating takeout. Not many prepare party foods from scratch, opting instead to cater some or all of it. 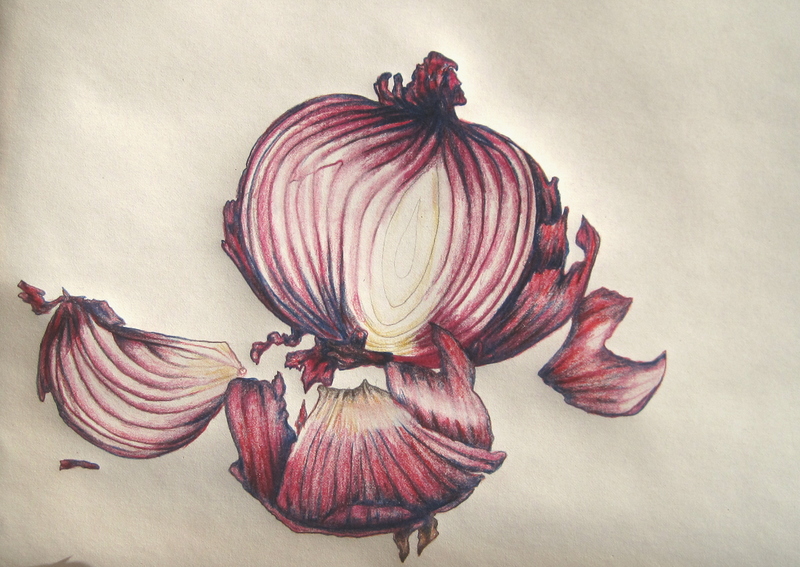 Does the average person know how to slice an onion anymore? Does it even matter? I posed this question to a friend who both cooks and thoroughly enjoys his gadgets. He said some skills are worth more than others, and one could argue that it matters more to know the ins and outs of technology rather than kitchen skills. If you really needed something chopped, you could hire someone to do it or (increasingly) buy it already prepared. I guess I’m just wondering if forgetting how to sew on a button by hand or how to slice an onion is worth what we’ve otherwise gained. I’m a cook and an artist, so my hands are everything. I’m compelled to get my hands dirty to access a personal, almost primitive power that makes me feel more human. But that’s one person’s take. *Recently set myself up on Pinterest (http://pinterest.com/mcproco/) and Twitter (@evesapple7). Come play!